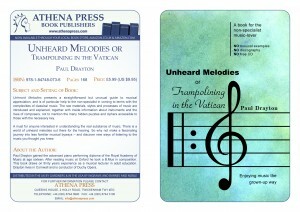 Unheard Melodies presents a straightforward but unusual guide to musical appreciation, and is of particular help to the non-specialist in coming to terms with the complexities of classical music. The raw materials, styles and processes of music are introduced and explained, together with inside information about instruments and the lives of composers, not to mention the many hidden puzzles and ciphers accessible to those with the necessary key. A must for anyone interested in understanding the real substance of music. There is a world of unheard melodies out there for the hearing. So why not make a fascinating journey into less familiar musical byways – and discover new ways of listening to the music you thought you knew. And by the way, only by reading the book will you grasp the significance of the book’s subtitle “Trampolining in the Vatican”.